I finished the alternate layout for Antique Lace. At this point it's a toss up as to whether I release both layouts in one chartpack or release them as separate designs. The only reason I'm considering separating the two is because the cost of printing both layouts as one chartpack will be astronomical - which of course would drive up the price of the design to the stitcher, who in all likelihood would only be stitching one or the other. If I release them as two separate designs, the price for each one would be a fair bit lower and people could just choose which one they like best. Makes sense, no? The only drawback to releasing them separately, is the fact that I had no plans to stitch both layouts, only the original one. 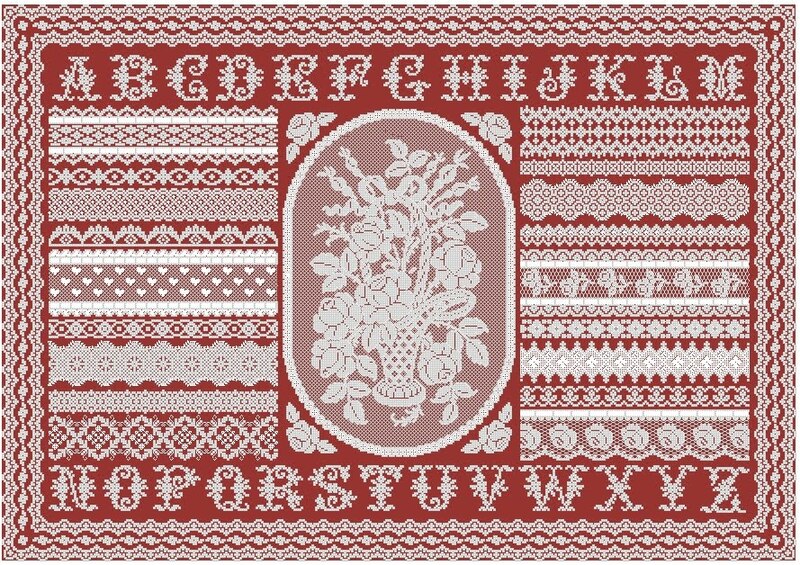 So I may be needing someone speedy to model stitch this band sampler layout for me. Problem there being that I can't afford to pay a model stitcher or buy materials for a second version. I can only offer free charts of my own designs - and of course the person would keep the finished model and could use whatever materials they wanted - I just need it for pictures. Hmmm... decisions. And just as a "refresher", here is the original layout of the design - the one I'll be starting on this week when my fabric arrives. I'm assuming it will arrive this week, most stuff takes 7-10 days to get here. Can you tell I'm really, really, really wanting to get started?? Have a great weekend and personally, I would sell them separately simply because of the cost of it all. I really like your second version of Antique Lace! Beautiful! Both are lovely, but I really like the long version. But I do like the floral panel (just took a close-up look at it) I can see how both would appeal. You are so talented! I am supposed to go to Brenda's in the next couple of weeks. Hubby and I need to go to the big city to do some shopping! Thank you guys!! I'm really itching to get my needle going on this one.